Here's a fine little advert for a Portland bike shop. A low-budget affair, but very effective. All in all, it promotes cycling - and the bike shop - well. One thing I find a tad problematic is that in the storyline we are presented with a character, the motorist, and he is a bit of a cliché. A stressed, irritable office jock. He contrasts well with the cyclist on the bridge, sure, but this advert draws a line in the sand between 'them' - the motorists, and 'us' - the cyclists. The cyclist on the bridge pities the motorists with a shake of the head. She has seen the light and the motorist is a fool for being blind to it. It's a little too self-righteous and I would understand it if many motorists would felt alienated and mocked by the advert. Two characters are presented and we, the viewers, will automatically try to identify with one of them. Many people will identify with the man and not the cycling rep for a sub-culture. What about a regular Joe/Jane on the bike on the bridge? A mirror image of the man in the car, just happier and calmer. And why not just let the cyclist ride over the bridge without even looking at the traffic, perhaps chatting with another regular cyclist on their way to work. Lots of angles available to tweak it and to appeal to both sides of the coin. 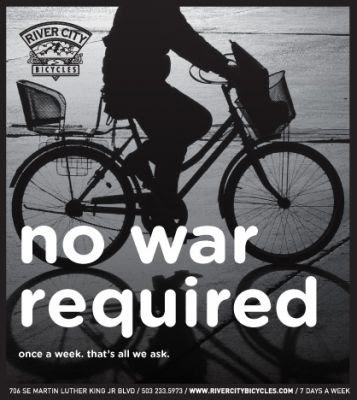 With all that said, this bike shop - River City Bicycles - has some great print adverts on this page. Cool stuff. Although on the left there a link to that fascinating American phenomenon - The Bike Fitting. Beginning at the power source - your feet - and working systematically up to your knees, hips, trunk, shoulders, elbows, and hands, our fit process dials in each of your body's position points. Getting every detail of your riding position dialed in to match your exact body size and riding style will help you acheive the ultimate goal: complete comfort in the saddle. Full fit points include: cleat placement, crank length, seat height, body angle and position, stem length, height and angle, bar width, and brake hood position. A Full Body Fit takes two hours and requires an appointment. TWO HOURS?! Is this not overcomplicating a rather simple issue? The person isn't going to enter the Tour de France. "Hey, all you need is a bike! Um... but before you get your bike, you'll have to spend two hours listening to technerd babble... yes... yes... I know it's a simple machine... yes... yes... I know people have been riding them for over a century without any fuss... but listen... you NEED a bike fitting, or else you just can't ride... Thursday from 1 - 3 pm?" But then I've been here before... haven't I... in the Terminology Folly post over at Copenhagen Cycle Chic.